Compete in the 2016 SNBF Carolina Supernatural in Spartanburg, South Carolina! Lancaster, South Carolina. Compete in the the NGA Red Rose City Classic! Garden City, South Carolina. Compete in the ANBF Coastal Carolina Natural Pro/Am III. Sumter, South Carolina. Compete in the 2017 INBF South Carolina Championships! Spartanburg, South Carolina. Compete in the 2017 SNBF Carolina Supernatural Championships! Lancaster, South Carolina. Compete in the 2017 Natural Muscle Association Clash Of The Carolinas! September 2017 (Date TBD) The date will be added when it is finalized. Lexington, South Carolina. Compete in the 2017 OCB Carolina Classic! Garden City, South Carolina. Compete in the 2017 ANBF Coastal Carolina Natural III! Lancaster, South Carolina, Compete in the 2017 NMA Clash of the Carolinas. Sumter, South Carolina. Compete in the 2018 WNBF Pro Bikini INBF South Carolina Natural! Ponte Verde, Florida. Compete in the 2018 NPC Olympian Lee Banks Natural Championships! Charleston, South Carolina. Compete in the 2018 OCB Port City Classic! Lancaster, South Carolina. Compete in the 2018 NGA PRO AM Royal Cup Classic Natural Bodybuilding, Bikini, Bikini Model, Figure, Male Physique, and Classic Physique Championships! Spartanburg, South Carolina. Compete in the 2018 SNBF Carolina Supernatural! Spartan, South Carolina. Compete in the 2018 NGA South Carolina Hub City Classic. Greenwood, South Carolina. Compete in the 2018 ANBF Emerald City Presented By Hard Rock Natural Classic Pro Am! Lancaster, South Carolina. Compete in the 2018 NGA Red Rose City Classic. Lancaster, South Carolina. Compete in the 2018 NMA Clash of the Carolinas! Sumter, South Carolina. 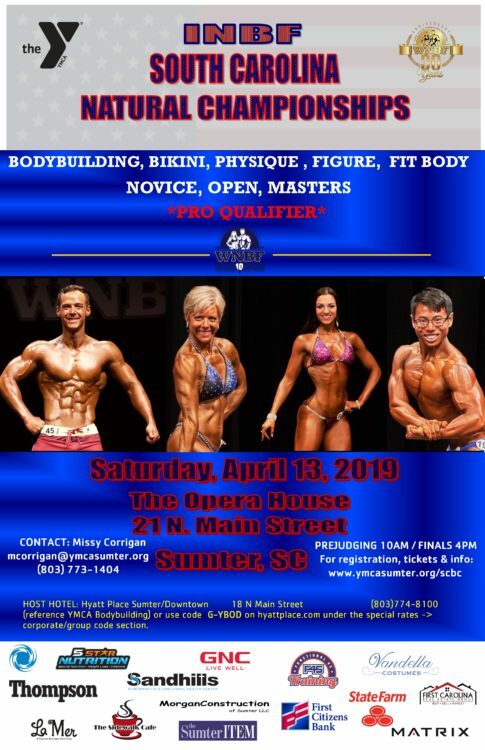 Compete in the 2019 INBF South Carolina Natural Championships!